The Royal Arcade, which extends from Bourke Street through to Little Collins Street, was erected in 1869 for Messrs. Staughton and Spensley. Charles Webb was the architect and gained the commission through a design competition. It consisted of 29 shops of various trades. At the extreme end of the Arcade facing Little Collins Street there were two or three shops of larger dimensions. In this portion of the building at shop 27 there were contained the Turkish Baths. In 1902 an Annexe was built to Elizabeth Street to the designs of architects Hyndman and Bates and an arched verandah was added to the Bourke Street facade. Due to dilapidation caused by rats' tunnels, the original Castlemaine flag floor was replaced in 1934 by black and white concrete squares which, were later replaced by similarly coloured terrazzo tiles. In 1892 the figures of Gog and Magog were installed at the southern end of the main walkway. These were sculpted by Mortimer Godfrey and modelled on effigies in the Guildhall, London, which were built in 1708 to replace those lost in the Great Fire of 1666. They were thought to represent survivors of a race of giants destroyed by Brutus the Trojan, the legendary founder of London. Gaunts clock was also installed at about this time. In 1890 at least two of the original shopfronts to the Arcade were replaced with new bay windows, splayed entrances and mirrored pilasters between each shop entrance. The remainder were replaced in 1894 under the guidance of architect Nahum Barnett. A cantilevered verandah has been added to the Little Collins Street facade, probably in the 1950s. In 1980 restoration works were undertaken which included the restoration of the Bourke Street facade, the reconstruction of the verandah and the internal gaslight fittings to the original designs. The Royal Arcade property is owned by Royal Arcade Pty Ltd, a company with 32 separate shareholders each holding a head lease over their respective shops which are variously owner-occupied or tenanted. 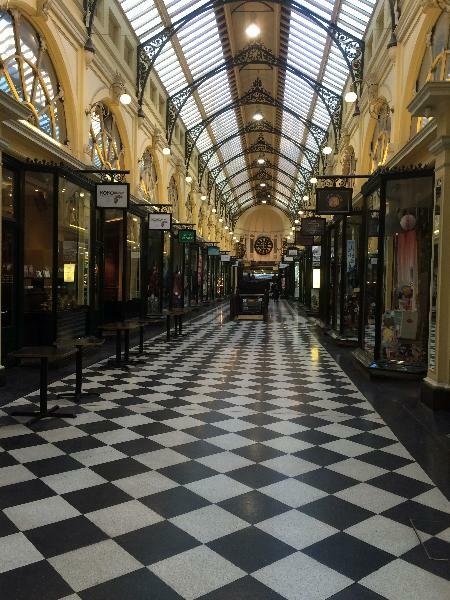 The Royal Arcade is of social, historical, aesthetic and architectural significance to the State of Victoria. The Royal Arcade is of historical significance as one of the earliest arcades constructed in this country and Australia?s oldest extant shopping arcade. Royal Arcade is one of approximately 18 surviving pre-1870 arcades worldwide. The Arcade?s automata, Gog and Magog, and Father Time are icons in the psyche of Melbourne. They are well known to visitors, sought out by tourists and are unique in Australia. The ownership of the Arcade by the Staughton and Spensley families for 103 years from 1855 to 1958 is of considerable significance and has left an enduring mark upon the building. Socially the Arcade is significant as containing the premises of John Nicholas Caire and Thomas Chuck, notable Melbourne nineteenth century photographers, Catanch?s the jewellers, the Doll Hospital, the Turkish Baths and Gaunt?s watchmaking workshop and shop, all of whom are Melbourne 'institutions'. The Royal Arcade is of architectural significance as one of the few commercial works of notable Melbourne architect Charles Webb. Designed in the Italianate style, it compares well with many nineteenth century European examples and is certainly outstanding within the Australian context. It draws on early and influential French and English models and as such is outstanding in its ability to demonstrate the essential and typical qualities of those designs and the continuity of the tradition of covered shopping streets. This is the oldest surviving arcade in Melbourne and despite its many alterations still maintains its elegant and unique appearance. It is a landmark of the central shopping area. Royal Arcade, 331-337 Bourke Street, Melbourne, Melbourne City Council. 1. 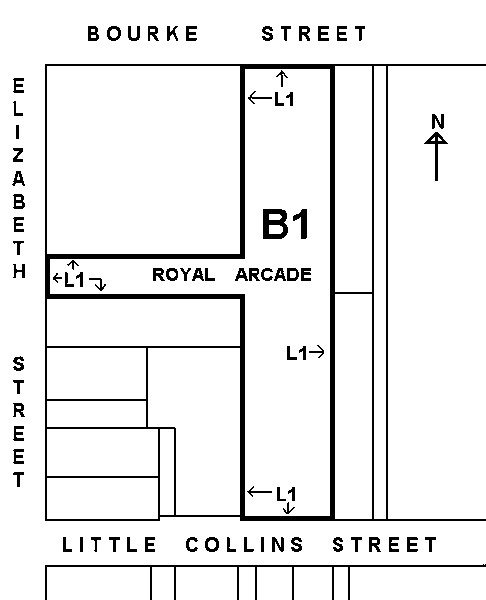 All the building known as Royal Arcade including verandahs marked B1 on Diagram 23 held by the Executive Director. 2. All the land marked L1 on Diagram 23 held by the Executive Director, being the land described in Certificate of Title Vol. 10022 Fol. 456-498, strata plan SP 35729. The Royal Arcade was erected in 1869. 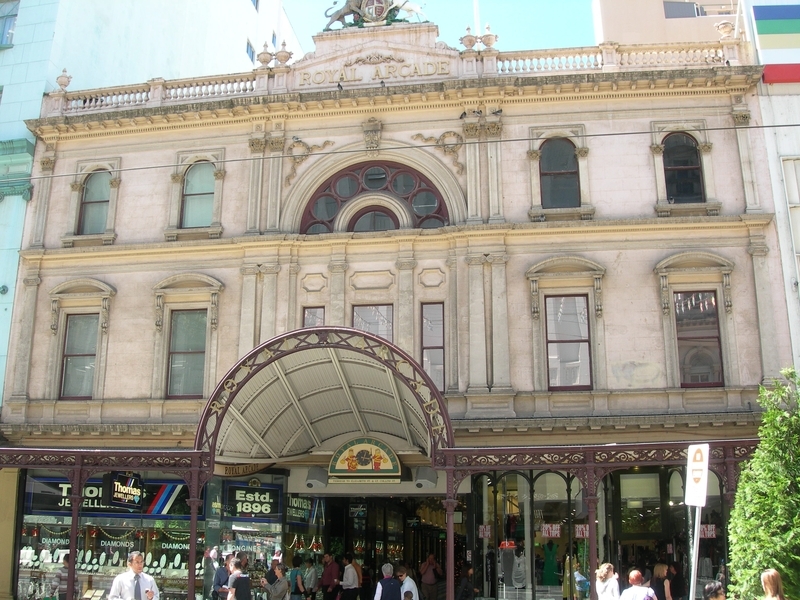 It was one of the earliest arcades constructed in this country, is Australia's oldest extant shopping arcade and one of approximately 18 surviving pre-1870 arcades world wide. Historically the Arcade is significant as containing the premises of John Nicholas Caire and Thomas Chuck, notable Melbourne nineteenth century photographers, Catanch's the jewellers, the Doll Hospital, the Turkish Baths and Gaunt's watchmaking workshop and shop, all of whom are Melbourne 'institutions'. Royal Arcade is Australia's oldest extant shopping arcade and one of approximately 18 surviving pre-1870 arcades world wide. The design of Royal Arcade draws on early and influential French and English models and as such is outstanding in its ability to demonstrate the essential and typical qualities of those designs and the continuity of the tradition of covered shopping streets. 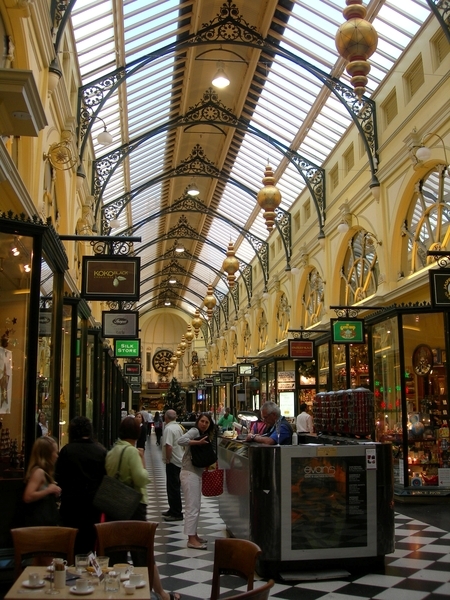 Royal Arcade was one of the few commercial works of notable Melbourne architect Charles Webb. Designed in he Italianate style, it compares well with many nineteenth century European examples and is certainly outstanding within the Australian context. It draws on early and influential French and English models and as such is outstanding in its ability to demonstrate the essential and typical qualities of those designs and the continuity of the tradition of covered shopping streets. The Arcade's automata, Gog and Magog, and Father Time are icons in the psyche of Melbourne. They are well known to visitors, sought out by tourists and are unique in Australia. The ownership of the Arcade by Staughton and Spensley families for 103 years from 1855 to 1958 is of considerable significance and has left an enduring mark upon the building. 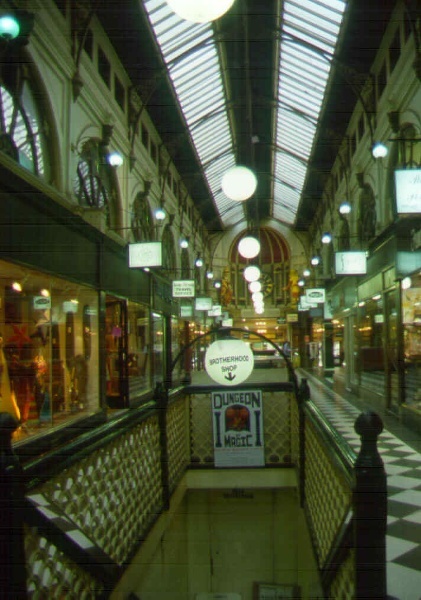 The Arcade is significant as containing the premises of John Nicholas Caire and Thomas Chuck, notable Melbourne nineteenth century photographers, Catanch's the jewellers, the Doll Hospital, the Turkish Baths and Gaunt's watchmaking workshop and shop, all of whom are Melbourne 'institutions'. * No permits are required for works which are in accordance with the Conservation Policy contained in Royal Arcade, Melbourne, Conservation Management Plan, prepared by Allom Lovell & Associates Pty Ltd for Royal Arcade Pty Ltd, June 1995. General Conditions: 1. All exempted alterations are to be planned and carried out in a manner which prevents damage to the fabric of the registered place or object. General Conditions: 2. Should it become apparent during further inspection or the carrying out of works that original or previously hidden or inaccessible details of the place or object are revealed which relate to the significance of the place or object, then the exemption covering such works shall cease and Heritage Victoria shall be notified as soon as possible. Note: All archaeological places have the potential to contain significant sub-surface artefacts and other remains. In most cases it will be necessary to obtain approval from the Executive Director, Heritage Victoria before the undertaking any works that have a significant sub-surface component. General Conditions: 3. If there is a conservation policy and plan endorsed by the Executive Director, all works shall be in accordance with it. Note: The existence of a Conservation Management Plan or a Heritage Action Plan endorsed by the Executive Director, Heritage Victoria provides guidance for the management of the heritage values associated with the site. It may not be necessary to obtain a heritage permit for certain works specified in the management plan. General Conditions: 4. Nothing in this determination prevents the Executive Director from amending or rescinding all or any of the permit exemptions. General Conditions: 5. Nothing in this determination exempts owners or their agents from the responsibility to seek relevant planning or building permits from the responsible authorities where applicable.